We had a great time at the luncheon, photos will be coming. Wonderful food and conversation as well as seeing all the cars that showed, Bill's photo albums, door prizes, and the overall program. Below is the PDF of the collectable brochure handed out. It was a great show with over 350 cars, good weather, wonderful people and seemed everyone had a good time. Here is a write up of the event and the finals winners are linked below. Looking forward to 2014! January 16, 2013 Monthly Membership Meeting , 7:45 pm, American Legion Hall, 1355 Balls Hill Road, McLean, Virginia. No general meeting - Club Flea Market - Bring your extra car parts and other Model	A related items to sell or swap. Visitors welcome. February 20, 2013 Monthly Membership Meeting , 7:45 pm, American Legion Hall, 1355 Balls Hill Road, McLean, Virginia. Visitors welcome. Hunter Fanney will give a presentation on restoring his prize willing Model A.
February 24, 2013 Antique Car & Train Day at the Clements. March 20, 2013 Monthly Membership Meeting , 7:45 pm, American Legion Hall, 1355 Balls Hill Road, McLean, Virginia. Visitors welcome. Movie/video about early automobiles. April 13, 2013 Cherry Blossom Parade, Washington, DC. participants MUST be registered. Please contact Clarice Shaw for details. April 17, 2013 Monthly Membership Meeting , 7:45 pm, American Legion Hall, 1355 Balls Hill Road, McLean, Virginia. Small parts clinic. Visitors welcome. April 27, 2013 9am - 3pm. Small Parts Day at Janet Merkel's. May 15, 2013 Monthly Membership Meeting , 7:45 pm, American Legion Hall, 1355 Balls Hill Road, McLean, Virginia. Visitors welcome. Seminar on judging the Model A.
June 16, 2013 Sully Fathers Day Antique Car Show, Sully Plantation, Dulles, Virginia. Visitors welcome. June 19, 2013 Monthly Membership Meeting , 7:45 pm, American Legion Hall, 1355 Balls Hill Road, McLean, Virginia. Visitors welcome. July 17, 2013 Monthly Membership Meeting , 7:45 pm, American Legion Hall, 1355 Balls Hill Road, McLean, Virginia. - No General Membership meeting. 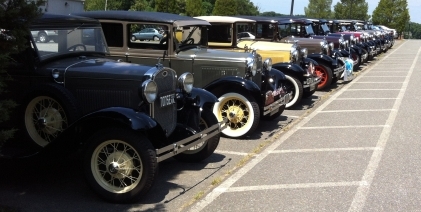 Club Flea Market - Bring your extra car parts and other Model A related items to sell or swap. July 21, 2013 GWC 50th Anniversary Celebration, Mt. Vernon. Reservations required. August 21, 2013 Monthly Membership Meeting , 7:45 pm, American Legion Hall, 1355 Balls Hill Road, McLean, Virginia. Visitors welcome. We are having a presentation on the history of tires by Cliff Green. September 18, 2013 Monthly Membership Meeting , 7:45 pm, American Legion Hall, 1355 Balls Hill Road, McLean, Virginia. Visitors welcome. We are having a presentation by Bennie Leonard on the ins and outs of the Model A Front end, what to look for on yours to determine it's condition, and what it takes to restore it. The Program will be in conjunction with a Front End Clinic, with details to follow. Come and learn how to get the Model A driving straight again. September 29, 2013 Annual Club Picnic. It will be held from 11:00 to 3:00 PM at the home of Bob and Billie Warhurst. Come join your fellow Model A Club members for an afternoon of old cars, good food and lots of fun with family and friends. October 16, 2013 Monthly Membership Meeting , 7:45 pm, American Legion Hall, 1355 Balls Hill Road, McLean, Virginia. Visitors welcome. We are having Club History Night. This is a follow on to the Club's 50th Anniversary Luncheon at Mount Vernon. All members are welcome to come and tell us stories about the Club's history. Bring on those stories. Tom Quigley will share some of the Club history from the Club archives. Come along and be ready to listen. Monthly Membership Meeting , 7:45 pm, American Legion Hall, 1355 Balls Hill Road, McLean, Virginia. Election night. Visitors welcome. December 7 & 8, 2013 24rd Annual Model Train Show. Hours are Sat. 10-5 and Sunday 12-4. Adults $5, Children $1. http://www.fairfax-station.org/calendar.html for details.